Decorating the nursery is one of the fun parts when expecting. But with so many options, it can quickly become overwhelming. One key item needed in this room is a hardy rug. Sure, the pattern is a fun aspect, but there are also some other things to consider. I wrote this piece to give you all the basics, so you don't have to (but you can:) waste too much of your precious time. I hope that this guide helps you decide between the best nursery rugs. Just keep on reading! How to Choose the Best Nursery Rugs? Rugs cover only part of the floor, so they aren't the same thing as carpets (yeah, didn't know that either). Here's a list of things to consider before purchasing a rug for this beloved room. Take a look at each to apply it to your nursery. How big should the nursery rug be? Larger rugs make the room look bigger and vice versa. But you can accentuate items like your comfortable new glider with small nursery rugs them. So the answer depends on your taste and needs. The shape of the rug will change the aesthetic and theme of the room. Choose from rectangular, circular, or even one in the form of a cloud. It's important to choose a rug that will be both safe and comfortable for the little one such as cotton. Cotton is harder to clean though. Personalizing the baby room can be therapeutic. Keep in mind that patterned rugs also hide eventual stains. A rug that isn't easy to clean helps to add more stress to your hectic life. You should consider an anti-slip rug if your nursery has a wooden floor. Or you could put two-sided tapes (or special carpet-tapes) under it to prevent sliding. What Are The Advantages of Having a Rug in this Room? Where Should I Put This Rug? As I've already mentioned (sorry for repeating myself), you can use nursery rugs to accentuate stuff or cover the entirety of the room with them. Buy an accent rug if you wish to highlight a specific item or area such as the man-glider or a reading area. If you want the nursery look bigger or have a nice big soft playing area, buy an area rug. These rugs typically overlap underneath the nursery furniture. Is There Anything That I Should Avoid? 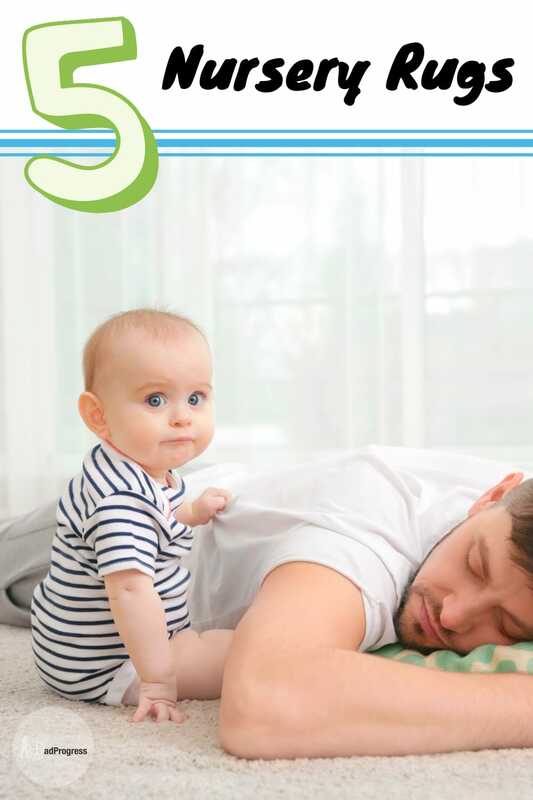 When deciding which rug to buy, it is best to keep the baby in mind. Rugs that have tassels and fun other additives may not be the best decision. True, these are very interesting for your active one-year-old. But if the additives come off and are small, young children may choke on them. As an addition, your rug doesn't look that good after your toddler has done everything in his or her power to remove all the accessories. Above all, the baby’s safety should come first. If your rug needs anti-slid rubber, make sure to take care of that before baby uses his or her nursery for the first time. As I've discussed in my article about baby towels, using different chemicals is part of the manufacturing process. It doesn't mean that the material is harmful. That said, if the rug is easy to clean, it's a good idea to wash it before first use. This ensures that all the residue chemicals are washed off. Oeko-Tex Standard is a great way to ensure that no harmful chemicals are used. It's a global testing and certification system that has a big list of forbidden substances. Sadly, it's not easy to ding nursery rugs that meet this standard. This rug is engaging and stimulating for the first few years of life. The colorful schools, hospitals, airports, and houses are a great way to grab children's attention. The mat measures 80 inches by 40 inches, making it ideal for a large area and a top contender among best carpets for a nursery. It can also be conveniently rolled up and stored for when you want to change the theme of the nursery. 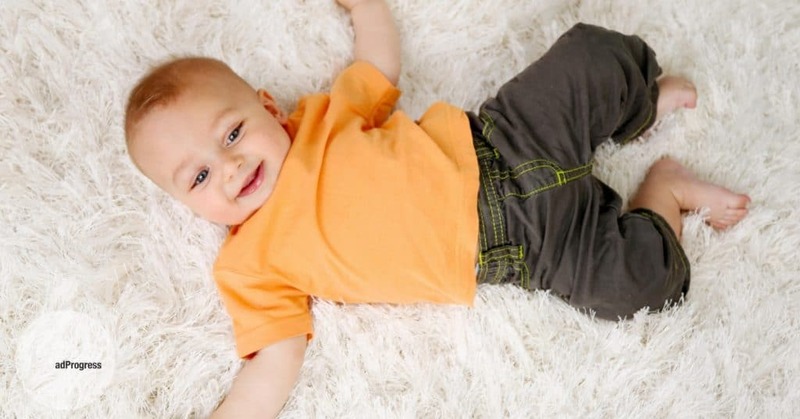 The SofTiles Playmat is an excellent alternative for any nursery seeking a thick "rug." It can easily come apart, yet are durable enough to stay together when played on. These mats are made with non-toxic materials. They are ideal for any hard surface such as wood floors or concrete basements. Another important feature is the sloped borders to prevent tripping. The design for these mats is safari animals, with a range of different colors to choose from such as pinks, blues, and various multi-cored options. The shag rug can be used for a nursery as it is stylish and functional. It can be bought in different sizes, but the 3’3’’ by 4’7’’ is a popular choice. The strong power-loomed construction offers your child soft padding with a durable surface. It's made 100% of polypropylene, a safe material also used in diapers. This is one of the best carpets for the nursery because of how easy to match with other furniture in the room as they do not have loud or intricate designs. It also lays flat without pulling up at the corners for no tripping. It is made with 100 percent lambskins that are natural and imported from Australia. The size is two by 3 feet with a soft white lambskin appeal, making it a great smaller rug to accentuate items in your baby nursery. If you're looking for a soft nursery rug then this may be the one for you. This Turkish rug is a candidate for one of the best nursery additions for its materials. It is also made from 100 percent Polypropylene, which is harmless for your infant. This product is typically used as an area rug, taking up a good amount of space with the dimensions of 5 by 7 feet. It is an affordable option, especially for the quality. It can also withstand various stains that might be caused by children. Finding the right rug for your baby’s nursery can be tricky, as all parents have different needs. In this review, we have looked over five different products, each having attributes that one should consider. If you want a soft, affordable nursery rug, then go with the Ottomanson Collection Shag Rug (Check the latest price on Amazon). Woolino Naptime and Play Rug (Check the latest price on Amazon) is an excellent small nursery rug. It meets the Oeko Tex 100 Standard, so it's also one of the safest nursery rugs out there. Extra Large Kids Playmat Rug City Life (Check the latest price on Amazon) is a great nursery rug if you have an older toddler at home and wish for something more engaging.